FamilyFarmed’s annual Good Food Festival & Conference is the oldest and largest event in the Midwest focused on local and sustainable food. At its heart are the producers, buyers, sellers and others who exhibit their businesses there. The 12th annual Good Food Festival & Conference is scheduled for March 24-26 at Chicago’s UIC Forum. Exhibitor registration is open, and you can still catch a $50 discount if you sign up by Dec. 31. Click here to see an exhibitor kit that includes an application form. Several of our previous exhibitors have volunteered to share their experiences and the value of participating in this event. Here are the reflections shared by chef Josh Katt, founder and owner of Kitchfix, a Chicago-based company that prepares and delivers delicious meals to homes and catered events made from local and sustainably produced ingredients. Josh’s relationship with FamilyFarmed now extends to his participation as a Fellow in the second year of the organization’s Good Food Business Accelerator program. I remember the first time I saw an heirloom tomato. It was on a farm visit to which my chef took me to learn about where our food came from. This was about 12 years ago at Bistro Bella Vita in Grand Rapids, Michigan. “Farmer Dave” showed us the multiple varieties of organic heirlooms he grew for us: Cherokee purple, Green Zebra, Brandy Wine, German Stripe, Ananas Noir. He grew more than 10 varieties of heirloom tomatoes. We then toured his rows of purple peppers, purple haricot verts and purple potatoes. As a young cook, I had no idea that this world existed. We had to work hard back then to find quality sources of local, fresh, organic, unique and cared-for varieties of fruits and vegetables. Getting heirlooms at Whole Foods just didn’t happen. 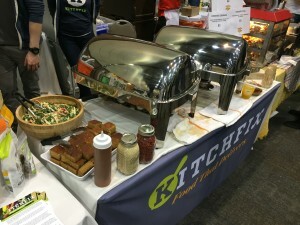 Kitchfix, a Chicago-based company that delivers meals from sustainably produced ingredients to homes and catered events, has been a participant in the Food Court at FamilyFarmed’s annual Good Food Festival & Conference, and will be participating again at the event next March 24-26. But over time, truly Good Food has become more widely available, providing ever-growing opportunities for chefs like me and companies like the one I founded and run: Kitchfix, which has developed a menu of delicious home-delivered or catered prepared meals and snacks that emphasize anti-inflammatory ingredients, powerhouse superfoods, herbs and spices, clean sources of meats and organic produce, sourced whenever possible from local producers. And the cool thing: It’s less about the chef putting it on the plate for the diner. It’s more about the diner or grocery shopper wanting and expecting those things. I’ve recently been able to get to know Jim Slama, one of the early adopters and proponents of the Good Food movement. Jim has a long resumé of caring for our local food economy and Good Food. He has, for more than 15 years, headed up FamilyFarmed, a Chicago-based non-profit dedicated to building both supply and demand for local, sustainably produced food. Jim has championed Good Food on multiple levels, but one of the biggest ways he and FamilyFarmed do this is driving economic growth through business development opportunities. The organization is best known publicly for its annual Good Food Festival & Conference and its spinoff, the Good Food Business Accelerator — a competitively selected entrepreneur fellowship program in which I’m pleased to be a participant this year. Josh Katt (in white shirt), chef/owner of the Kitchfix prepared meals company, discussed his products with Illinois Gov. 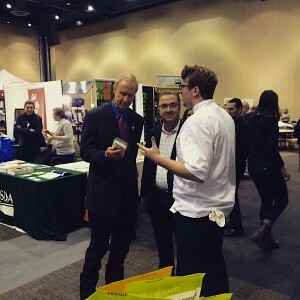 Bruce Rauner (in suit) during FamilyFarmed’s 2015 Good Food Festival & Conference. For the past two years, my company Kitchfix has been apart of the Good Food Festival & Conference in Chicago. Through this event, Kitchfix has met clients, grocery buyers and investors… not to mention the 2015 event last March when Illinois Gov. Bruce Rauner visited our booth and chatted with us. The conference portion includes people like Rick Bayless, a culinary legend from his Frontera Mexican restaurant group who also is a major champion of local food sourcing, as well as experts in funding and many other topics. The best part is the opportunity to network with the other vendors — people who are dedicated and passionate about Good Food and about creating a sustainable food system based on local and high-quality ingredients in the Midwest. I’m excited about how popular this movement is becoming in Chicago and how readily available quality products are becoming. We’re excited to be apart of this movement, and we’re excited to see where it goes. At Kitchfix, we’re looking for ways to move beyond just the labels of “organic and local” and moving to a fully transparent system of sourcing. It’s exciting and challenging, but we know that transparency and honesty is equally as important to the Good Food movement as the products we’re using. 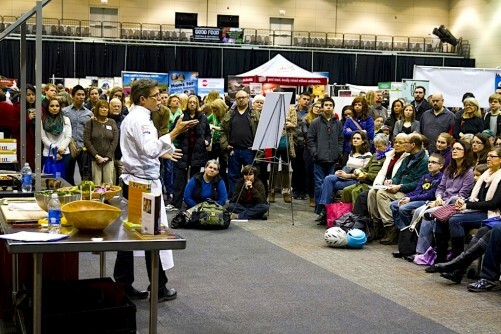 FamilyFarmed’s next Good Food Festival & Conference is March 24-26 at Chicago’s UIC Forum. Kitchfix will be there again, and I hope you’ll visit us. 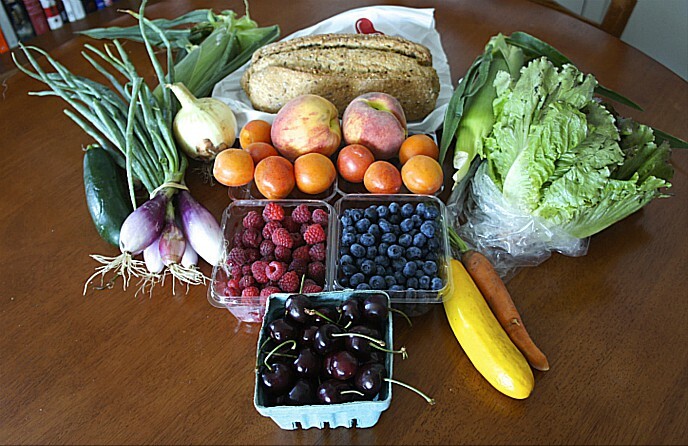 And don’t forget to keep supporting your local farmers markets and local small businesses! This movement wouldn’t be happening without you! This entry was posted in Farm to table dining, Food and health, Food Artisans, Food Entrepreneurs, Good Food Business Accelerator, Good Food business development, Good Food Dining, Good Food Festivals, Local Food, Sustainable dining and tagged Good Food Business Accelerator, Good Food business development, Good Food Festival & Conference, Good Food prepared meals, Josh Katt, Kitchfix. Bookmark the permalink. Healthy Soil Compost is a residential and commercial organic waste hauling service. We offer the end piece to this local and good food movement by capturing the energy wasted in a landfill and processed, to be returned to local Chicago farmers. All good food businesses should adopt a composting service otherwise they are not fully supporting sustainable local food production. Farmers do not gain organic energy from landfills.